It was one of the night's biggest prizes and all of the Arkells were in the building but they did not take time to accept the award. Instead they granted the time to Jeremy Dutcher, who won Indigenous album of the year earlier in the night but got caught off when he was speaking. Frontman Max Kerman told us that he ran into Dutcher when he was going to the bathroom. He asked Dutcher what table he was at and then when the band's name was announced, Kerman swung by the table and picked him up on the way to the stage. It's a biggie, and it goes to Shawn Mendes, who was already won another trophy tonight for pop album of the year. He's also up for single and songwriter of the year tonight. 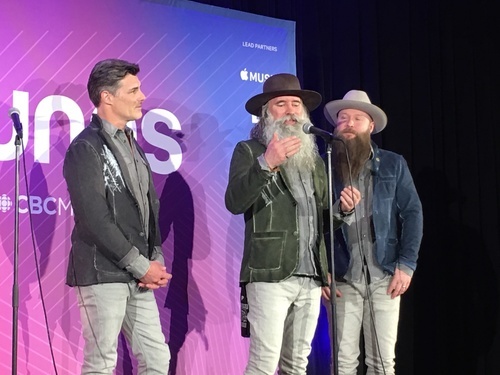 The dudes have the best beards at the awards this weekend. They were up against 88Glam, Dizzy, Elijah Woods x Jamie Fine and London's own Loud Luxury. The band is from Vancouver. 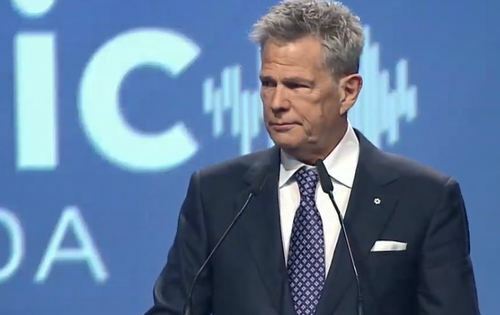 After a passionate introduction by close friend Michael Buble, David Foster is on the stage now, talking about his foundation and accepting his award. He is talking about what it means to be Canadian. He equates it to have a secret weapon in your back pocket. "We are loud and we are proud of our own." "Anyone who is in a position to do good should accept it as a responsibility, not as a burden." He's been pretty serious so far but he just cracked a joke. "When am I ever going to get a humanitarian award? It's like a funeral when I'm alive." If you can't be here tonight, you can watch the show online. In addition to the awards, there will also be musical performances from Francophone pop star Hubert Lenoir, singer-songwriter Donovan Woods, alt-rockers Dizzy, reggae artist Exco Levi and Halifax band Port Cities. After winding through 38 different awards, everyone is pretty spent. I gotta scurry off and file for radio and online. But the fun doesn't stop. The big, big show is tomorrow night at Budweiser Gardens. Several awards will be given out including fan choice, album, group, breakthrough artist and country album. Keep your eyes peeled for more coverage throughout the evening right here. ... but the media room is still going strong. Bahamas is here now talking about his win for adult alternative album of the year for Earthtones. He says he doesn't think about genre anymore when making music. "Most artists just want to make something cool," he said. "When I was young, you had to pick a lane. You had to be punk ... I would listen to Alan Jackson in my closet when no one was listening." He also really, really wants to collaborate with tonight's biggest winner Shawn Mendes. He did it again. Mendes is four for four tonight, up for two more awards tomorrow. Show off! 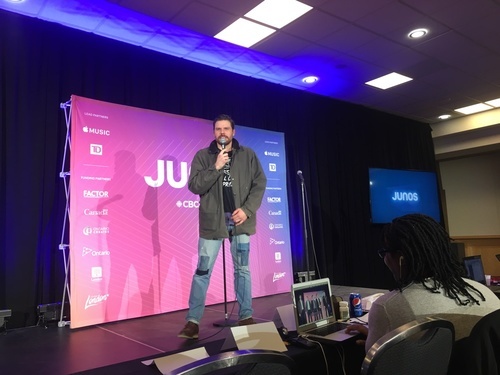 I've been slipping behind on getting you winners, perhaps enjoying the musical stylings of reggae superstar Exco Levi, who has won multiple Junos and is performing on stage now. The winners that have happened since I last updated you. It's Mendes third win of the night. He is on tour, so again he's not here to pick it up. Mendes has the most nominations of any artists this year, with a total of six. He won pop album and artist of the year earlier tonight. He's still up for single of the year (handed out tonight) and fan choice and album (handed out on the broadcast tomorrow night). A album with bong in the title now has a Juno. And so does American rapper Post Malone, who predictably, is not here tonight to accept his award. So enjoy this video of him in the meantime. Broadcaster Duff Roman is this year's recipient. He gave a nice speech, running through his years in the business and those who helped out along the way. P.s. He's got a great voice! After scoring album of the year at the Grammys, Kacey Musgraves get some love at the Junos. Her Canadian record engineer was just given recording engineer of the year. He's in the media room now, breaking down the win. He said he was confused when the Musgraves team asked him to mix the record as he had never mixed a country record before. His advice for folks that want to do what he does is simple ... "work hard and be nice." Speaking of nice people, Sarnia, Ont. 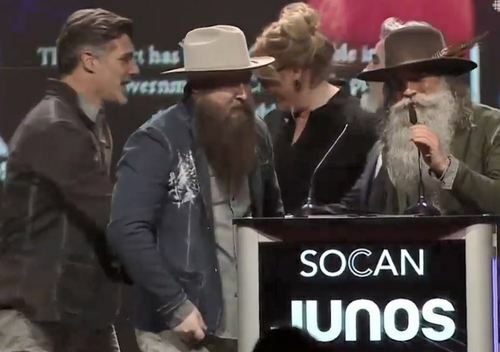 's very own Donovan Woods won for contemporary roots album. He's the third local to win on tonight's broadcast, after comedy album's Dave Merheje and children's album's Splash N'Boots. He is talking about how he feels "siloed", pointing out the range in his fellow nominees, from Snotty Nose Rez Kids to Leonard Sumner. "The nominees were so far acoustically speaking from each other. Why is that? ", he said. "Representation is important and we are not to be siloed." The electro pop duo is from Montreal. During their acceptance speech, they congratulated all the other females in the category including REZZ and iamhill. They also gave this really nice sign off. "We are musicians. We are artists. It is a very, very difficult industry to be in," they said. "Take care of yourselves." 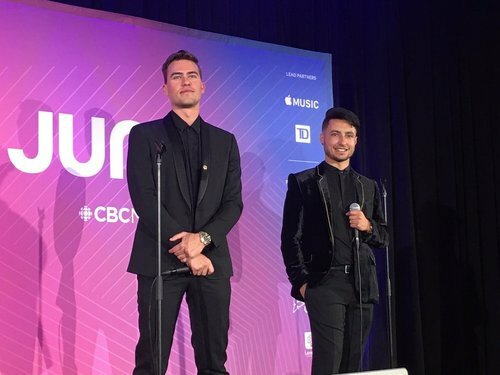 In one of the most passionate speeches of the night, Jeremy Dutcher honoured all his fellow Indigenous album nominees and told many of the music industry members gathered in the room that they could be doing better. 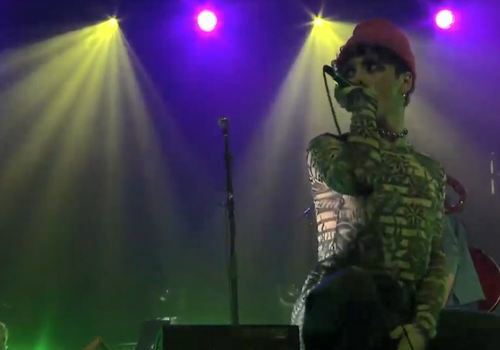 "Our music is not niche, our music is saying something," he told the crowd. The prize doesn't necessarily come as a surprise. 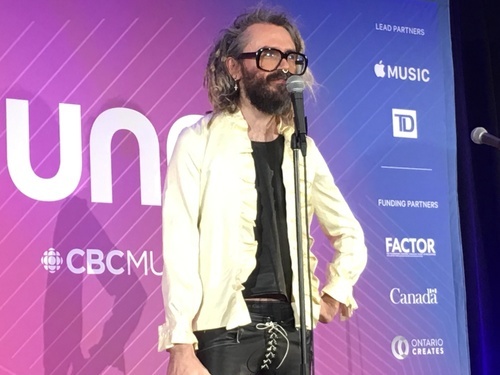 Dutcher was the winner of this year's Polaris prize. Here's his performance from that. They won breakthrough group of the year earlier tonight. The conversation is largely about country music. They said there is so many country bands and festivals in Canada so they are humbled that it gets recognized in this way. They are also giving some advice. "It sounds cliche but dream big," says Aaron Grain, far left in the photo below. The artwork was done by Rhye's mastermind Mike Milosh. It includes an image that I definitely probably could not show on this live blog. So my apologies for that. We've been graced to a little break from awards as Donovan Woods honours some of the Canadian musician and industry members who passed away this year. The band's Nick Adams got up on stage saying that he grew up on a chicken farm 20 minutes from here. And that's true. I got to talk to him when the nominees were introduced and he was super excited the Junos were coming to his town. He said London was the first place he snuck into a concert, a Tea Party show. Gridina won instrumental album of the year for China Cloud. He played with Dan Mangan's band but this is a solo venture for him. LOVECOLLIDE was up for contemporary christian/gospel album for Tired of Basic. Voivod won metal/hard music album. They are in the press room now, talking in French about their win and their time spent making music over the years. They were last nominated in 1993, but this is their first win. They said all over the world, metal bands from Canada are known for being very technical. But that's not necessarily the case in Canada, where they aren't as known. "We're sort of still mystified by it." 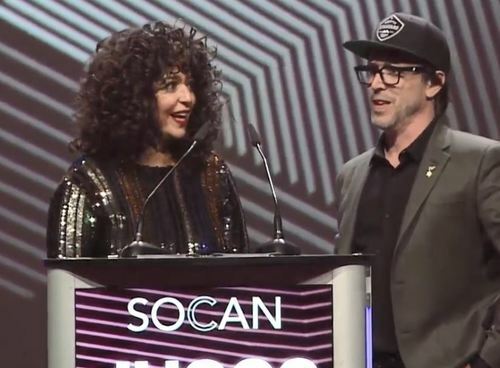 Dizzy took home alternative album for Baby Teeth, a surprise for the Oshawa band who were up against alternative heavy weights like Tokyo Police Club and Destroyer. The Toronto Symphony Orchestra won for Vaughan Williams, while Tory Lanez was awarded rap recording for LoVE me NOw. He is not in the building tonight to accept his award. David Foster has made an appearance in the press room, post humanitarian award win. They just announced that this is the last question and he said "f--- 'em." "That's going to go out all over the night." The next winner to stop by happened to be Laila Biali, who won vocal jazz album. There was this nice spontaneous moment. And what a coincidence ... Dave has won comedy album of the year. 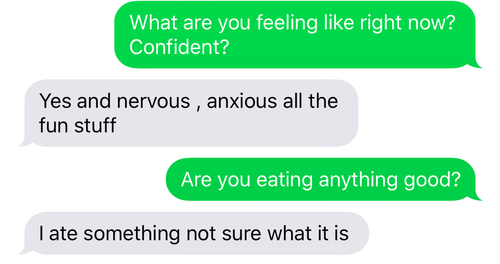 I'll text him to get his feedback. He told us he really didn't think he was going to win. I'm not actually inside the gala room. So I've been keeping updated on the gala floor by comedian Dave Merheje, who is up for comedy album of the year. He's from the area as well, from Windsor, Ontario. Here's his thoughts so far. Very deep conversation as you can see. Biali had pretty good odds in this category. She was up against herself, as she was also nominated for the album Sun Songs with Jodi Proznick. Also nominated? Diana Krall, who Biali said got her into playing jazz music when she was 15. He said he didn't expect the award. He thanks everyone for playing world music in Canada. 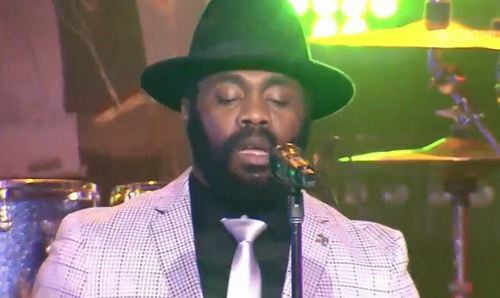 The music comes on to cut it off, but he sneaks in one last word, dedicating the prize to Haiti, his country. We've been breezing through awards. Here's some of the other prizes handed out. That video's director Ali Eisner is in the room now. If you haven't seen the video yet, it is full of puppets and is heartwarming. The London duo spent time talking about growing up in London, being born in Victoria hospital and going to school at Western. "This is an extremely crazy full circle moment for us." They were talking about Body, which they won for. It's pretty much been inescapable, but they said they never get sick of playing it. 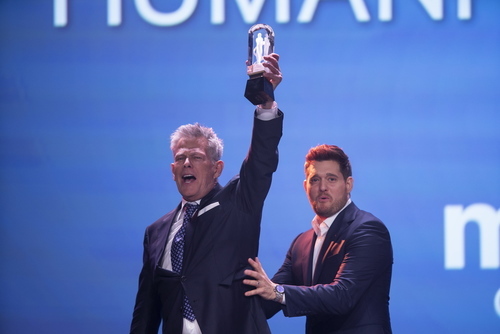 Buble is in the building, accepting the adult contemporary album of the year prize for his album Love. Shawn Mendes gets the next win, for pop album of the year, for his self-titled release. He is also on tour and unable to be here for the win. For her album Vienna: Fin de siecle. She is in Europe so she was unable to accept the award. The dance duo who met in London receives the first award of the night. Pretty fitting considering what city we are currently in. They were up against Gotasoul (ft. James Baley), AZARI, Jackie Chan (ft. Preme & Post Malone), Dzeko & Tiësto, Avatar Beach, Jacques Greene and CURA, Keys N Krates. Billy Talent frontman Ben Kowalewicz is here, hosting the gala. He jokes he will be the Sarah McLachlan for the night ... a nod to tomorrow night's host. He started by introducing us to "music's longest night." Ben is joined by co-host Julie Nesrallah, who hosts Tempo on CBC Music. Lenoir is wrapping up his bombastic performance of Ton hôtel. It was filled with expletives, perhaps why it was not on the main broadcast. He just arrived from Texas, where he made his American debut at South by Southwest. The night has begun with a speech from Allan Reid. He's the head of the Juno Awards and CARAS, who are putting on the show. He's running through a list of thank yous. And now we've got a musical performance from Hubert Lenoir. He's a star in Quebec, but many in English-speaking Canada might not know him. That's about to change -- he's up for three Junos this year, including album of the year. Greetings. My name is Haydn. 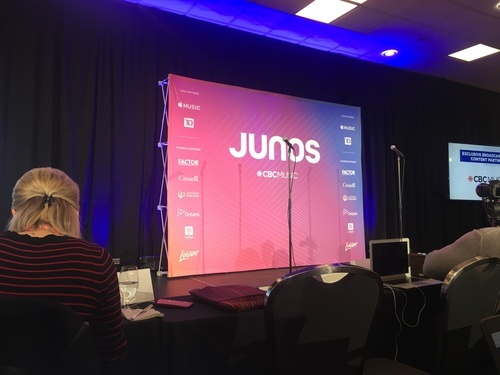 I’ll be your guide to the Junos gala throughout the night. I’m backstage in the media room at the gala, ready to type furiously as winners are announced and recipients start filing in to tell us what they think. 38 awards are being handed out tonight, which represents the bulk of the prizes. They include the humanitarian award, which is being given out to David Foster, and the Walt Grealis special achievement award, being given to broadcaster Duff Roman. Some of the big prizes handed out tonight are single of the year, artist of the year and songwriter of the year.